A father driven into desire, a son coveting that of his father's, and the sorrowful maternity that hovers them into tragedy. Q: What is the name of the opening music? Kim Ki-Duk's films portray a black world view, one by which our selfish impulses cause us to destroy each other and, ultimately, ourselves. They are driven by the central character's desire to escape this world, in their own ways eventually finding a way out of the reality that engulfs them. In Real Fiction (2000), the protagonist disappears into a day dream in which he has revenge on all those who wronged him in the past; in Spring Summer Autumn Winter... And Spring (2003), a Buddhist monk lives, literally, on an island separated from the rest of the world; any contact with the outside world results in tragedy, be it a visiting mother fleeing with her child (she drowns, though the child, gratefully, survives), or the monk's apprentice running off with a girl (he ends up murdering her and is wanted by the police); in Bad Guy, the eponymous protagonist tries to find solace through his own love fantasy; and then there is 3 Iron, Kim Ki-Duk's magnum opus and one of the most remarkable films ever made. 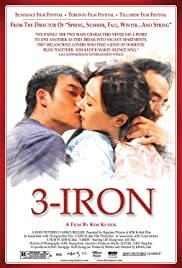 3 Iron seems to tie all the visual and thematic aspects of Kim's films together, neatly and impressively, making it the "ultimate" Kim Ki-Duk film, much the same way Fitzcarraldo is the "ultimate" Herzog- or North By Northwest was the "ultimate" Hitchcock film. Like every Kim Ki-Duk film, the protagonist is a rank outsider from mainstream society. Like Bad Guy, the character plays his part almost entirely mute (and on this note, both Jo Jae-hyeon's and Lee Hyun-kyoon's performances have to be utterly applauded for being both wonderfully subtle and yet so forcefully expressive). Once again, we are faced with a latent dual reality, where the protagonist escapes the world around him, but is also brutally dragged back into it. Like Bad Guy, 3 Iron is a strange love story, albeit a far more assuasive one, where both the characters decide to disappear into "their own world". However, 3 Iron defies explanation. Can you imagine trying to pitch this to a Hollywood producer? "Ok, there's this guy and he, like, breaks into people's houses. He washes their clothes, dishes, bathrooms -.. he even wears their clothes, sleeps in their beds, and repairs stuff for them, like clocks or broken toy guns (with hilarious consequences in the latter's case!). One day he breaks into a house, thinking he's alone, but meets an abused wife. When her husband returns, he proceeds to attack the old philanderer in a very original way (which neatly ties in with the title of the film... you'll see) and she runs off with him. They then enter "his" world and live "his" life together, breaking into houses, etc, before they get dragged back into the real world with all the pain and suffering it brings". Yeah! That'll really get the 18-25 demographic rolling down the aisles! Chances are I would have been kicked out midway through the second sentence, though if I'm really honest I wouldn't actually mind trying to pitch this to Don Simpson, just to see the reaction on his face. But it really would be doing this movie little justice to try and "summarise" it in some neat little way. It needs to be watched, it needs to be experienced, like all the great movies. There is no real "idea" in this film, necessarily, nor is there a big "statement" of sorts - Kim Ki-Duk is not a "statement" film-maker like Godard or Eisenstein. Rather, like Lynch, he prefers to make films that work on an instinctive level, in that they draw a gut emotional reaction from you that cannot necessarily be articulated or expressed in an intellectual manner. Is it any coincidence, then, that Kim, like Lynch, primarily hails from a painting background, and actually wanted to be a painter before he became a film-maker? Paintings are an apt analogy, since every frame is clearly carefully and thoughtfully choreographed (characters are either separated (in both the physical and emotional sense) by vertical-, or they are united by horizontal lines). But putting aside any visual- and textual comparisons to Lynch, Kim Ki-Duk also draws a lot from Wong Kar Wai in terms of narrative, and anyone who has seen Chungking Express should notice comparisons to 3 Iron in that both concentrate on a character who breaks into someone else's house/flat and lives their life without them noticing, or how one song is ceaselessly repeated to emphasise both the love between the two central characters and, furthermore, the characters' wish to escape reality (though 3 Iron does so more on a less literal level, as I mentioned before) - in Chungking Express, it was California Dreamin' (a song that will never be the same for me after that film, and I suspect a lot of people feel this way), while in 3 Iron it's "Gafsa" by Natasha Atlas. Still, I suppose I can conceptualise and intellectualise to my heart's content - somehow I doubt that any of this will spur you to watch this movie. But I think it should. This film deserves to be seen. It's a tender, thought-provoking, and ultimately (and quite strangely) heart-warming film, as well as, quite possibly. an indication that Kim Ki-Duk is slowly coming of an age as a film-maker, moving on from an entirely pessimistic worldview to one that is more reassuring and serene. Yes, there is suffering and darkness, but there is also hope, and I think, this, ultimately is what 3 Iron is trying to tell us. It is, in short, utterly required viewing, not to mention the work of a true genius. And it's really not very often I bandy this word about.